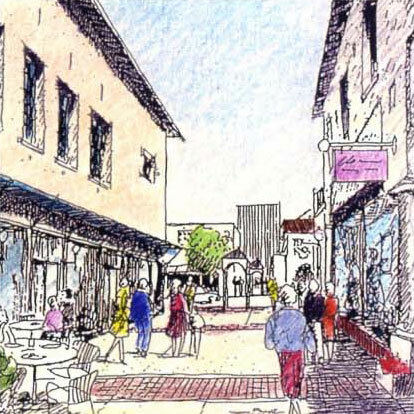 In 1993, the City of Palo Alto and Stanford University gathered a 'Dream Team' of planning and architectural experts together to assist in developing a plan that would reinforce the relationship between the city and the university. The master plan discusses how both entities could link to a mass transit hub. The team focused on the confusing intersection of Alma Street, University Avenue, El Camino Real, and Palm Drive. Tony Carrasco was a key player in developing how this node could become a useable urban front door. New train and bus depots would tie to a system of bike paths and trams. The underground railroad track would allow for sunlit green spaces along University Avenue. An oval shaped village green would line new two to three story buildings.